Leather shoes refer that are made of natural leather, such as leather or rubber, plastic, PU foaming, PVC, etc., which are formed by sewing, adhesive or injection molding. Leather shoes are breathable, moisture absorption, have good hygienic performance, is the highest grade shoes in all kinds of shoes. Because shoes are daily consumer goods, the people’s demand for leather shoes will change because of the change of all the year round, every quarter will have different categories products listed, each type of product sales prices and sales strategy for different season and there exist certain differences. Sales in the fourth quarter are usually the highest in a year, as there are more holidays in the fourth quarter and the traditional peak season for sales at the beginning of the year. 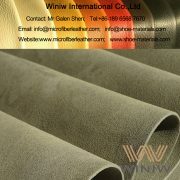 The sales of leather shoes are different due to economic development, consumer purchasing power, consumer aesthetic ability and climatic conditions. The eastern coastal developed areas and cities consumer purchasing power is higher, the pursuit of fashion, and therefore the demand for high-end fashion kind of shoes is higher, and three or four line city on the mainland consumers’ purchasing power is low, to meet the demand of basic functions of the product is higher. 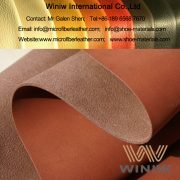 Winwi supply the highest quality leather material for leather shoes–Microfiber leather ,which has the same look as genuine leather, very good soft hand feel draping as natural leather, better physical & chemical performance than real leather, is the optimal alternatives to leather!